June 15, 2012 - Following last week's shocking news that cabin crew demanded a father remove his three year old son from an Alaska Airlines plane after the toddler was deemed too disruptive to fly, a survey conducted by flight comparison site Skyscanner of more than 1,000 parents has revealed that, far from being an isolated incident, 12% of parents said they have found it difficult to get any sympathy from cabin crew in response to their children’s needs. The toddler at the center of the incident first became upset when he was forced to switch off the reading device his father had given him to keep him busy. Many parents in the survey sympathise with this situation, with over a third having endured their child having a "meltdown" on an aircraft and 13% of respondents stating their children too have become upset after abruptly being told to switch off electronic devices by the cabin crew with no explanation or understanding of why. The unhappy child then refused to sit upright with his seatbelt fastened; something one in four of the parents surveyed have also experienced, and his parents were finally told they had to disembark the aircraft despite having his seatbelt fastened, because he wouldn’t sit upright. Skyscanner's Mary Porter commented, “There can be some challenges when flying with young children as they are too young to understand why they are being told to do certain things, but this can be made less stressful for parents if cabin crew staff can be more patient and understanding during these times. 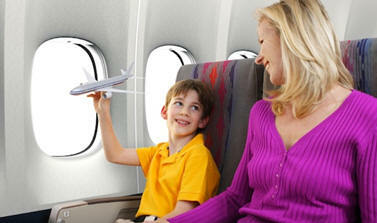 The survey also revealed that for some parents the stresses of family travel begin before they have even boarded the aircraft, with 16% saying their child had been frightened by the security process while for a further 15% the problems began the second they stepped on board, when they found themselves seated apart from their children. Furthermore, almost one in five parents complained about the lack of toilets and baby changing facilities along with long queues.